The Australian Declaration of Recognition introduces a new proposal for recognising Indigenous Australians. Sometimes we need to think about an old problem in a new way. 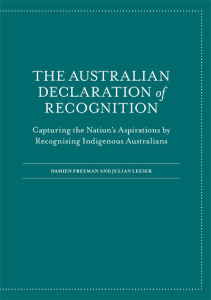 In this essay, Damien Freeman and Julian Leeser argue that we should rethink our approach to Indigenous recognition: instead of trying to insert some modest statement in the Constitution, we should consider adopting an Australian Declaration of Recognition, which would contain a powerful and poetic statement of the nation that Australia has become, and our aspirations for our nation’s future. In the United States, generations of Americans have drawn inspiration from the Declaration of Independence. So too, future generations of Australians will draw inspiration from the Australian Declaration of Recognition that we might adopt in 2017. In the next few years, Australians may decide to make substantive changes to the Constitution to address Indigenous issues. The purpose of some of these alterations is to change the cultural position of Indigenous Australians in the national story. We propose that, alongside any substantive constitutional changes, all historical and aspirational statements be embodied in an Australian Declaration of Recognition. An Australian Declaration of Recognition provides the best way to address cultural issues while avoiding legal technicalities. Uphold & Recognise is an organisation of Australians who are committed both to upholding the Australian Constitution and recognising indigenous Australians. It was formed by Damien Freeman and Julian Leeser, and launched in April 2015, by Noel Pearson at two key events in Sydney, at the State Library of NSW and Hornsby RSL. The Australian Declaration of Recognition’s greatest impact will be through the place it will hold in our national life, through its recitation at important ceremonial moments, including at the opening of parliament, civic ceremonies, citizenship ceremonies, and school assemblies. It is perhaps in this last arena that it will have its greatest impact. Coming generations of Australians will grow up reciting the Declaration on a regular basis: it will be committed to their memory; engraved on their hearts, and will form part of their make-up as Australians. Left outside the Constitution, the Declaration can raise the nation’s spirits and, unlike amendments to the Constitution, its words are not limited by being the subject of lawyers’ arguments. Properly harnessed, the Declaration of Recognition could transform the way Indigenous Australians and other Australians relate to each other within a generation. This approach to Indigenous recognition has received support from constitutional lawyers, including Professor Greg Craven, Vice-Chancellor of the Australian Catholic University. Julian Leeser was educated at the University of New South Wales, where he graduated in arts and law. Upon graduation, he served as Associate to the Hon. Justice I. D. F. Callinan AC at the High Court of Australia, and then as an advisor to the present Prime Minister. After practising as a solicitor, at what was Mallesons, Stephen Jaques, he served as Special Advisor on constitutional law to the Commonwealth Attorney-General. He was a Visiting Fellow of the Taubman Center at the John F Kennedy School of Government at Harvard University 2006–2007. He served as Executive Director of the Menzies Research Centre from 2006–2012. He is presently Director, Government, Policy and Strategy at Australian Catholic University. He was the youngest elected delegate at the 1998 Constitutional Convention and a member of the No Case committee during the 1999 referendum campaign. Since 2009, he has been Conference Convener of the Samuel Griffith Society — a constitutional law and public policy discussion group. In 2013, he was National Convener of the Citizens’ No Case Committee for the Local Government referendum. His publications include Don’t Leave Us with the Bill: the case against an Australian bill of rights. He is involved in a number of community organisations, including the Executive Council of Australian Jewry and the Chinese Australian Forum.